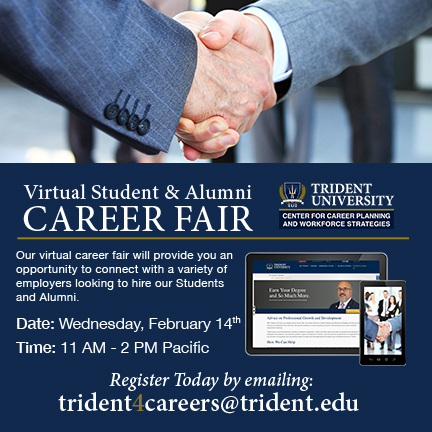 Trident will hold a Virtual Career Fair for students and alumni on Wednesday, February 14th from 10am to 2pm Pacific time. Organizations are seeking the leadership and critical thinking skills that our students and graduates bring to the table. - Manny Sepulveda, Manager, Trident’s Center for Career Planning and Workforce Strategies. Trident University International (Trident) will hold its next Virtual Career Fair on February 14th, 2018. Open to all students and alumni of the 100% online university, the event takes place from 10am to 2pm Pacific time. Employers who are confirmed to attend include Robert Half, Amazon, the Federal Bureau of Investigation (FBI), and Allen Customer Care, LLC. Trident’s student and alumni community, numbering over 30,000, includes talented men and women from all over the world, including many with a military affiliation. This is a unique opportunity for Trident staff and employers to engage directly with these talented students and graduates. Sepulveda, who joined Trident in 2013, assumed the role of Manager of the Center for Career Planning and Workforce Strategies in 2016. A veteran of the U.S. Navy, Sepulveda spent time as a counselor recruiter where he worked with petty officers, advising them on whether to reenlist or transition into civilian roles. While enlisted, Sepulveda earned two Navy Marine Corps Commendation Medals, nine Navy and Marine Corps Achievement Medals, and various unit and campaign awards. He earned a Bachelor of Science in Business Administration with a concentration in Human Resources from Trident in 2011. The free event is open to Trident students and alumni, but registration is required at either trident4careers(at)trident(dot)edu with “Virtual Career Fair” as the subject line, or through the Trident4Careers link on the MyTLC student portal. Founded in 1998, Trident University International (Trident) is a leading online postsecondary university serving adult learners. Trident uses the EdActive™ learning approach, which employs case-based learning in an online setting to teach real-world relevant critical thinking skills to enhance the lives and careers of students. Trident offers high-quality bachelor’s, master’s, and doctoral degree programs and certificates, led by a qualified faculty team, over 80% of whom have doctoral degrees. Trident is regionally accredited by the WASC Senior College and University Commission (WSCUC) and has over 30,000 alumni, including more than 22,000 with a military affiliation. The University has received multiple acknowledgements from Military Times, Victory Media’s Military Friendly Schools, and Military Advanced Education & Transition for their dedication to military-affiliated students. Visit http://www.trident.edu, Trident’s Facebook page, or call at (855) 290-0290 to learn more about Trident's wide range of educational options.